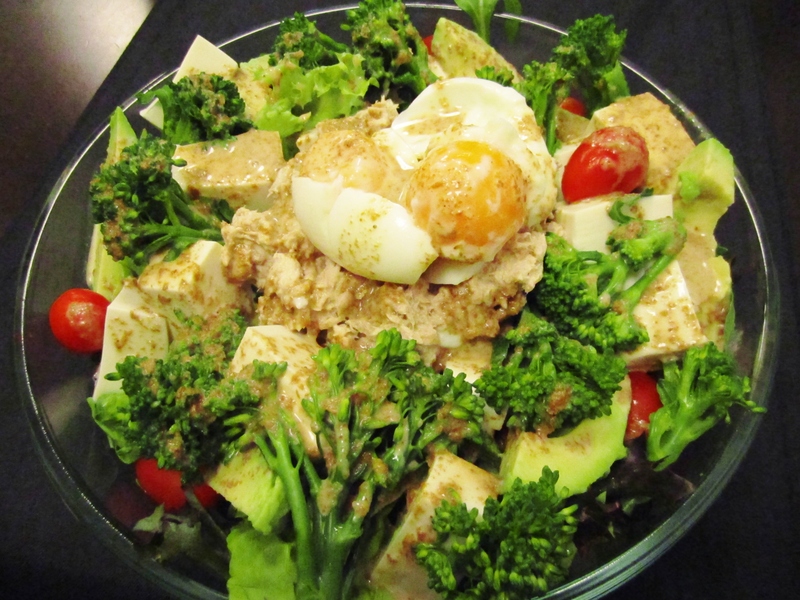 You may add whatever you like to your Japanese salad. This combination just happens to be a favourite of mine. Place all ingredients nicely in a dish. 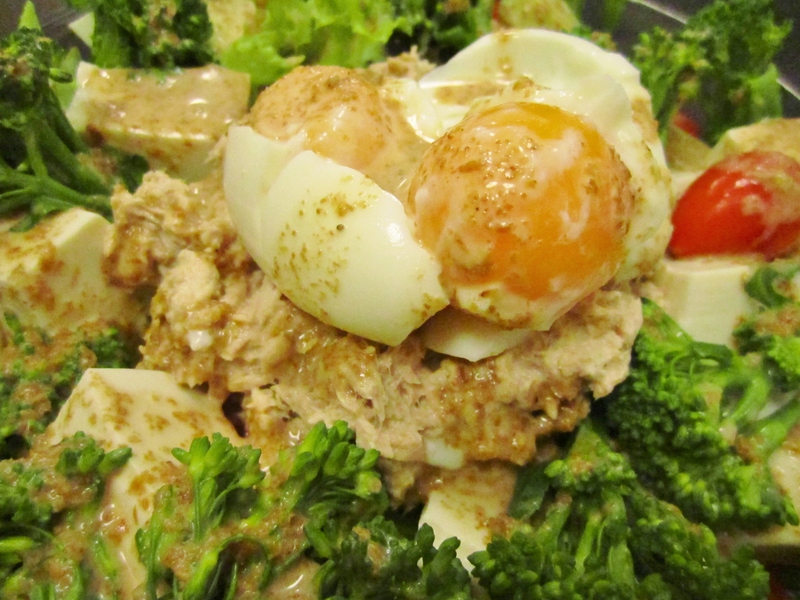 Drizzle with dressing and serve with extra dressing on the side. Simple. Good and healthy. Add a sprinkle of chilli flakes for a little spice. Add butter and oil to a medium pan and heat over medium heat. Add broccolini and lemon juice to pan once butter melts. Toss and let broccolini brown a little. When you have a man as wonderful as mine who is so supporting in your endeavours, you want to do a little something something for him from time to time to show your appreciation. I do so with making him a good meal (amongst other things). Japanese ranks first on our list of favourite cuisine followed very closely by Italian. And in third place it’s Mexican for him and Chinky food for me. 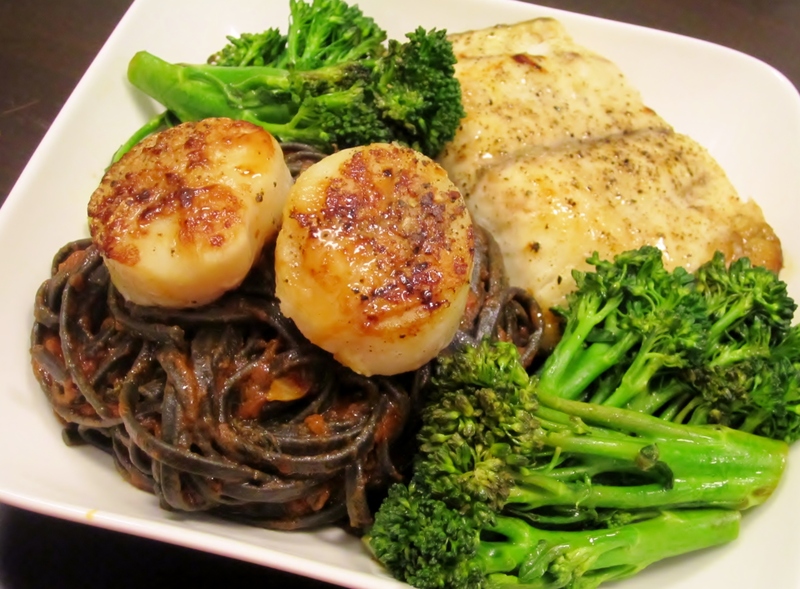 I bought fresh, meaty snapper from the wet market, beautiful, fresh fat scallops at Meidi-Ya and found arugula, broccolini, Burrata, Parma and squid ink pasta at ThreeSixty Marketplace, All the makings of a good meal I should think. And it was a good meal. 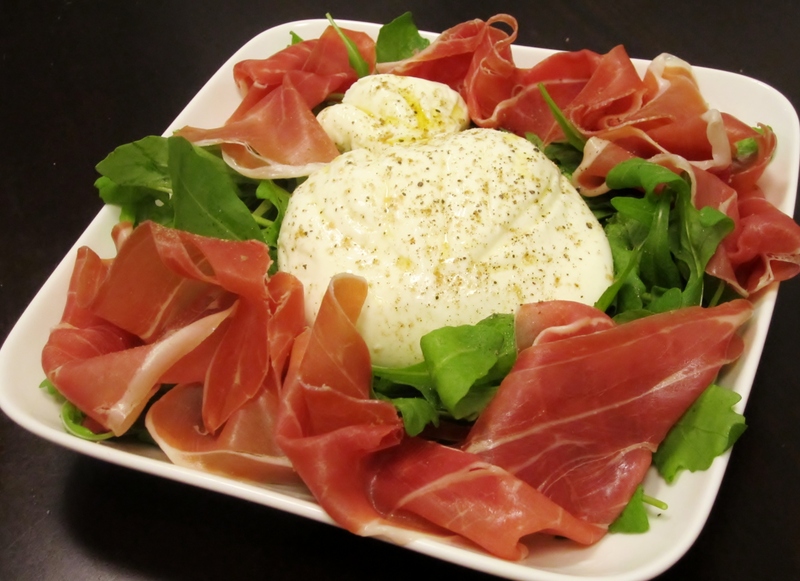 Burrata and Parma on arugula, drizzled with good extra virgin olive oil, pink Himalayan sea salt and freshly ground four peppers. It’s that sort of salad that is about premium ingredients and letting their flavours shine. We love fresh seafood. Anything frozen-thawed is a waste of money and time. There have been times I’ve found good quality frozen seafood like King Crab legs from America but those are far and few between. Scallops are never good frozen-thawed. Yes they look nice but will be tasteless. 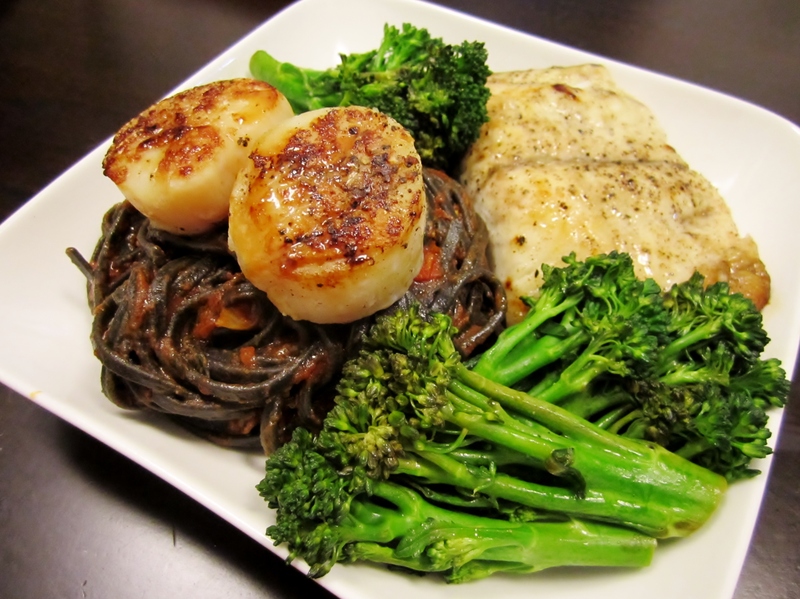 Aside from that bouncy texture, you eat scallop for the briny sweetness that is a scallop! Do not compromise. Fresh fish is also very important. The Mumsy raised me to eat fresh. Do not compromise. Good ingredients are key to a good meal. You can apply amazing cooking techniques to sub-par food and still have a sub-par dish. Spend the money on good ingredients. Do not compromise. It was a good meal. The complication of preparing this meal is in the sum of its parts. Fortunately, each part is minimum effort. The squid ink pasta is simply cooked and tossed in a sliced garlic, crushed tomato and olive oil sauce seasoned with lemon thyme, smoked sea salt and a crackling of pepper. The scallops were firm, sweet and worth every dollar paid. All you do is season very lightly with smoked sea salt and freshly cracked pepper then seared in a smoking hot pan for three to four minutes a side with a little butter. For me, that is the best way to have scallop aside from sashimi style. The fish was firm yet flaky. I don’t know why I decided to use the sticky lemon glaze from Tart Me Up on the snapper but I did. Radical but what a delicious random spur of the moment act! Get recipe here. 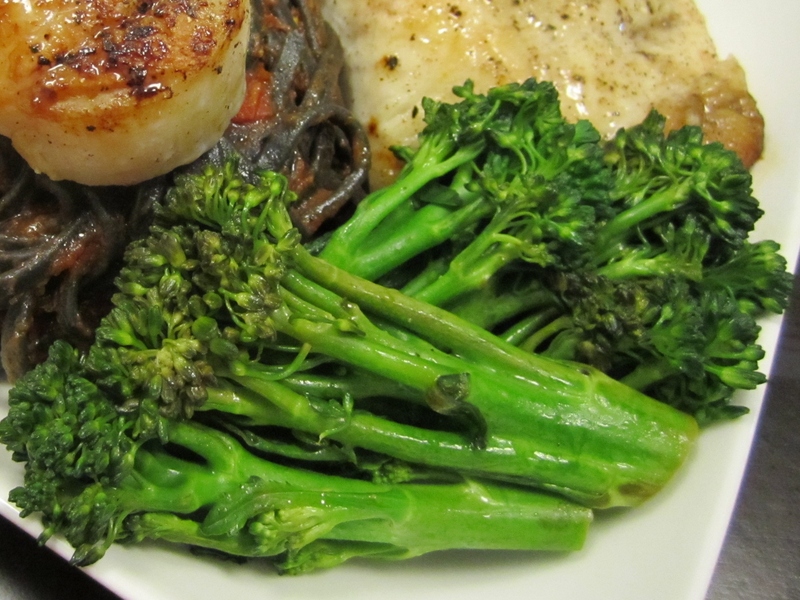 Have I told you about my obsession with broccolini? I love the stuff! It’s more expensive but I don’t care! I love it! If I see it, I will buy it! Get recipe here. 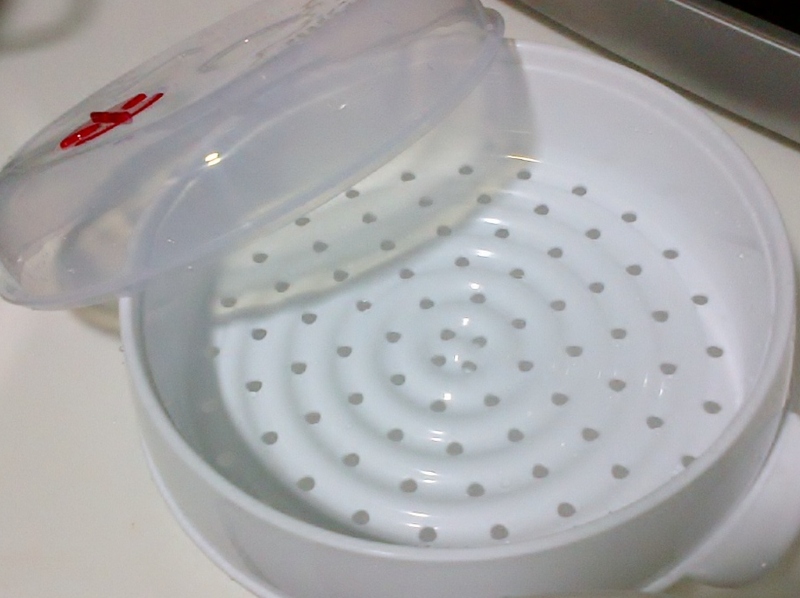 I also bought a little steamer for the microwave from Meidi-Ya. I love the stuff the Japanese create! It works really well too! 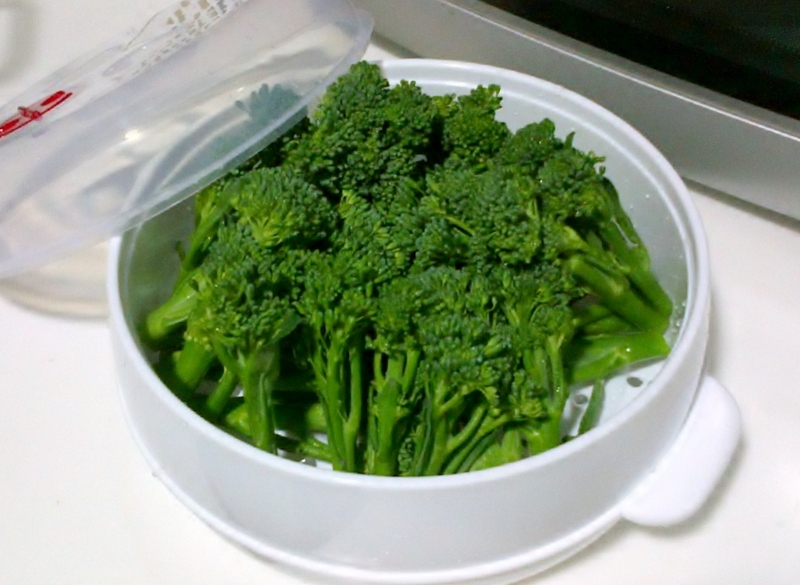 Perfectly steamed broccolini. I love cooking for my DCM. Watching him enjoy my cooking is such a rush! Cook for the one you love everyday and sometimes make it a little extra special just to emphasise your love.